The Indian automobile industry, comprising the passenger vehicle, commercial vehicle, three-wheeler and two-wheeler segments, continued its growth journey in fiscal 2018-19 albeit at a much slower pace in a difficult year. From a milestone perspective, the industry has driven past the 25 million-unit sales mark for the first time in a fiscal year – 26,267,783 units, which represents overall year-on-year growth of 5.15 percent, one of the lowest-growth performances in the past 12 years (see 12-year sales table below). What seems to have saved the blushes for industry is the outstanding performance of the CV sector which posted strong double-digit growth of 17.55 percent with robust sales in both M&HCVs and LCVs. 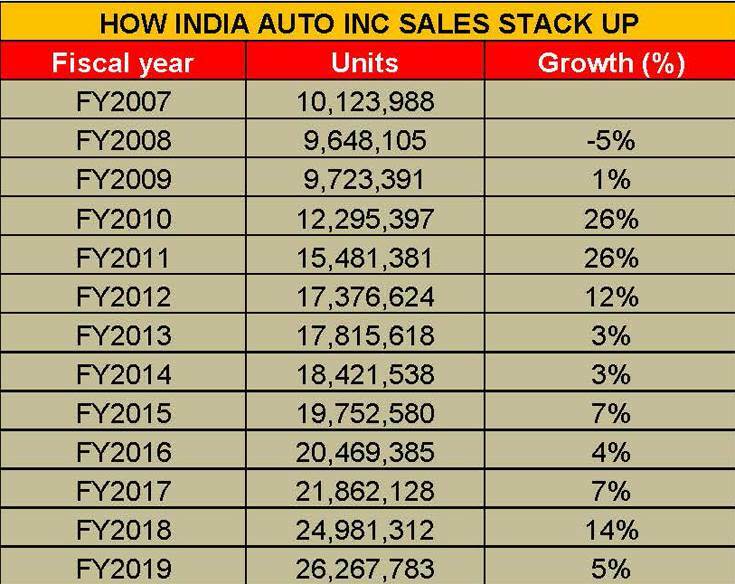 On the production front too, overall numbers at 30,915,420 (+6.26%) were the best ever by India Auto Inc. What's more, vehicles exports across segments totalled 4,629,054 units (+14.50%), again the best ever. What has impacted overall numbers is the tepid growth in the passenger vehicle (PV) and two-wheeler segments, and within them the SUV and scooter segments respectively. In FY2018, the PV segment had clocked 7.89 percent YoY growth with sales of 3,288,581 units with UVs notching handsome 21 percent growth. In FY2019, UVs with sales of 941,461 units recorded low single-digit growth of 2.08 percent. Likewise, scooters, which sold a total of 6,719,911 units in FY2018 (+20%), have seen sales slow down sharply to 6,701,469 units (-0.27%). Despite a flurry of new product launches during the last fiscal, PV OEMs haven’t been able to draw consumers in large numbers to their showrooms. 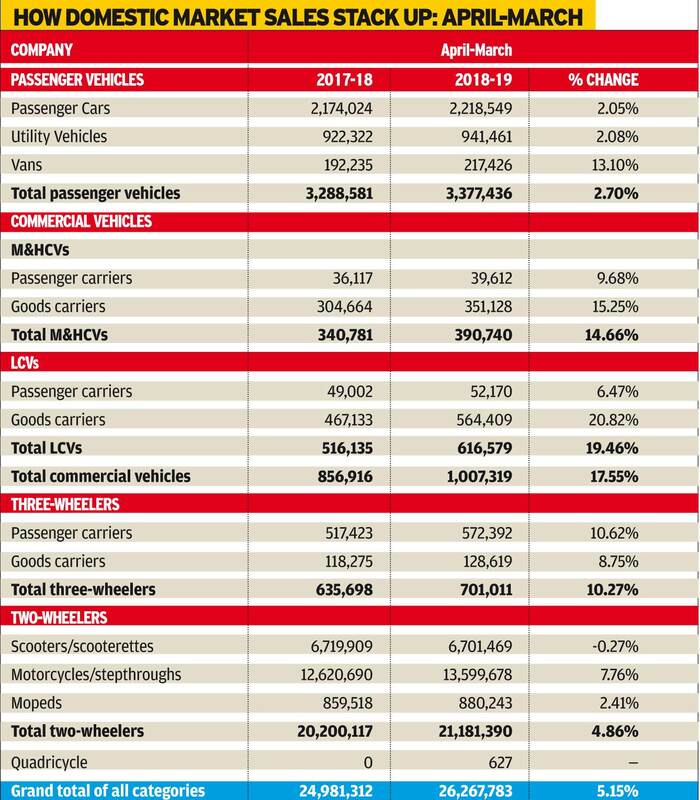 A total of 2,218,549 passenger cars were sold in FY2019, up a marginal 2.09 percent, 941,461 UVs (+2.08%) and 217,426 vans (+13.10), the last category on a low year-ago base. While the going was good till the first half of FY2019, from October 2018 a number of factors like spiralling fuel prices, a high liquidity crunch and poor consumer sentiment played spoilsport. The two-wheeler industry has seen its slowest growth after three years with total sales of 21,181,390 units, a less-than-expected growth of 4.86 percent. The numbers which were expected to rise during the festival season, were affected due to the rise in insurance premiums, in addition to the inventory pile-up at the dealer level. The most badly hit has been the scooter segment which reported sales of 6,701,469 units, which translates into negative growth of 0.27 percent, the lowest over a decade. Motorcycle sales totaled 13,599,678 units (+7.76%) while 880,243 mopeds were sold during the fiscal. While the domestic two-wheeler market is moving towards premiumisation, in the April-March 2018-2019 period, the mass-market models continued their growth momentum. If there is a winner then it is the commercial vehicle segment. With cumulative sales of 1,007,319 units in FY2019, India’s CV industry has clocks its best-ever fiscal sales and crossed the million-unit milestone for the first time by growing a strong 17.5 percent YoY. On April 2, Autocar Professional’s had first announced the CV industry notching this milestone – it’s an analysis which has now been proved right with SIAM releasing the official sales statistics. These numbers are despite the CV industry facing multiple headwinds during the year such as the revised axle-load norms, the NBFC crisis, slowing down of the economy and overall subdued movement of goods, rural market distress, and lower-than-expected activity in the overall manufacturing sector. What helped overall numbers was the brisk traction in the first nine months of FY2019 along with a push by the government in infrastructure spend, affordable housing and irrigation projects, partial replacement demand and higher freight movement that helped buffer the downturn. In FY2019, all segments of the CV industry including passenger and commercial vehicles have registered positive growth, indicating a strong year for overall trucks and buses. The overall M&HCV segments grew by 14.6 percent to a robust 390,740 units. (FY2018: 340,781). LCVs too saw sharp growth of 19.4 percent with sales of 616,579 units (FY2018: 516,135). The key beneficiaries from FY2019’s CV sales were tipper trucks and ICVs, with both segments seeing strong demand from the construction and e-commerce sectors, respectively isolated from the impact of the new axle load norms. With infrastructure projects on the upswing, the tipper segment remained buoyant throughout the year and grew in double digits. SCVs too recorded good growth as a good monsoon, improved private consumption and strong support from replacement demand and continuous demand for higher mobility in rural areas drove demand. While the going was good till September 2018, from October onwards a number of factors deterred buyers from making new purchases. A sharp rise in fuel prices which led to consumers backing off, as well as introduction of the three-year long-term insurance for PVs resulted in poor consumer sentiment and played spoilsport. “As per historical trends of last two election years - 2009 and 2014 - despite good demand in PVs, the growth in the pre-election year remains subdued,” added Wadhera. The closing month of March was even worse for the industry with manufacturers across segments moderating production and correcting inventory in order to compensate for the bloated stock situation. The industry registered cumulative sales of 1,908,126 units and overall slumping a significant 14.21 percent (March 2018: 2,224,224). While PVs clocked 291,806 units and were down 2.96 percent (March 2018: 300,722), CVs remained near-flat with volumes of 109,030 units (March 2018: 108,730). Total three-wheelers declined 9 percent with 66,280 units (March 2018: 72,465) and two-wheelers registered a dismal negative growth of 17.31 percent with 1,440,663 units going home to buyers (March 2018: 1,742,307). 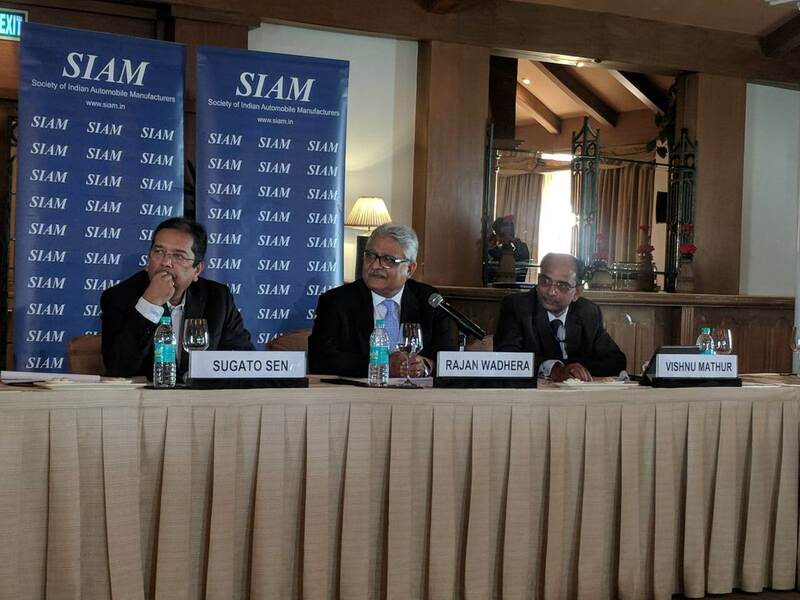 With the industry being used to observing a single-digit growth curve over the last decade-and-a-half, SIAM is hopeful of growth returning once the political environment in the country settles towards normalcy. The estimated GDP is expected to improve from 6.5 percent in H2 of FY2019 to 6.8 percent in Q1 of FY2020, with repo rates coming down by 2 basis points each in the last two monetary policies also expected to aid consumer buying in the coming quarters. Even though it forecasts a huge pre-buying ahead of BS VI as one of the enablers in the ongoing fiscal, not going overboard with expectations, SIAM has projected a modest growth curve between 3-5 percent for the PV segment, 10-12 percent for CVs and between 5-7 percent for two-wheelers. Three-wheelers are expected to continue growing between 7-9 percent for the next twelve months. While a weak monsoon could be one of the possible challenges in the year, “irrespective of the outcome of the general elections, we as an industry are very hopeful that growth will resume and continue in the coming times. Some launches have come to the rescue of the industry in FY2019 and a lot more are planned for the new fiscal year which keeps us optimistic,” concluded Wadhera.